How can I be certain my product will sell…BEFORE I create it? This is the same process the teams at DigitalMarketer and our sister companies use to plan and roll out new products, services and trainings. This process can be completed quickly, and all without having to leave your desk. Don’t worry, these tools are easy to use and they’re all either completely free or have free versions or free trials, so it’s not expensive to use them. …BEFORE you risk your precious time and money. Your low-cost entry point product (we call it a Tripwire) that converts your prospects into customers…. And you won’t have to guess! Plus you’ll get to watch over our shoulder as we create a product line and complete sales funnel from scratch… in a market we know nothing about… and with full confidence that it will sell! Do NOT Create Another Product Without Completing The Market Research Worksheet! Why risk more time and money creating a product before you know for certain there is a crowd of hungry buyers waiting to buy it? …you just need to use our proven market research worksheet to guide you in the right direction. 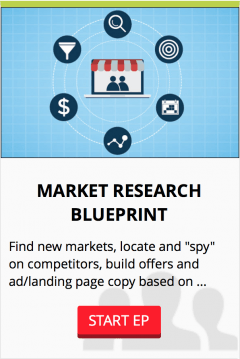 And price shouldn’t be an issue, because you can have access to the complete “Market Research Blueprint“ training (plus our almost magical market research worksheet) for just $7. You can become a life-saver at your company by being the guy or gal who finally knows (backed by actual market research) not only what products and services will sell, but also where to sell them, how to sell them, and even for how much. You’ll save countless time, money and headaches by only rolling out products and services you that you know ahead of time will sell.